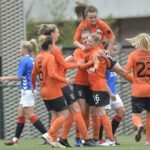 Glasgow City secured their place in the semi-finals of the SWPL Cup after a convincing 4-0 victory over Celtic. A Clare Shine double was added to with goals from Hayley Lauder and Megan Foley as City brushed aside their neighbours with ease. It was Celtic though who began brightly and they almost scored within the opening 20 seconds when Kodie Hay got in behind down the right, but her ball across goal was only put past the post by Josephine Giard. City’s first chance fell the way of top scorer Kirsty Howat at the edge of the box with the striker bending her low shot just wide of the post. Natalie Ross and Sarah Ewens then both squandered chances for Celtic with both players firing over the bar when in decent positions. 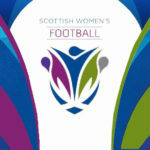 The hosts recovered and almost opened the scoring on 23 minutes when Hayley Lauder’s shot from distance was pushed onto the bar by Celtic keeper Megan Cunningham. It wasn’t long however before City did take the lead with Lauder this time getting the better of Cunningham, her shot from 25 yards flying into the top corner. Cunningham then denied Lauder a second with a smart save almost immediately after kick-off, but Clare Shine slammed a volley into the roof of the net as City grabbed a quick-fire double. City made it three in less than ten minutes when Shine tapped home her second after Cunningham had initially parried away left back Nicola Docherty’s shot. Shine was celebrating what she thought was her hat-trick soon after but her joy was cut short by the linesman’s flag for offside. Celtic knew they would need an early goal in the second half if they wanted to get back into the game, but instead it was the home team who got the fourth goal when a delightful cross from Docherty was diverted into the net by Megan Foley. Leanne Crichton almost got in on the act just after the hour mark with her low strike coming back off the base of the post. The closest Celtic came to a consolation was a header from Claire Crosbie which landed on the roof of the net while at the other end Shine fired over when it looked easier to score. 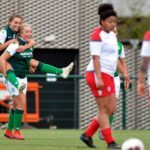 Elsewhere, Rangers were 4-1 winners over Forfar Farmington, Hibs won 6-0 at Stirling University and Spartans defeated Motherwell 5-0 at Ravenscraig. The semi-finals will both be played on Sunday 14th April at the Broadwood Stadium with the draw for those ties available here.